It was exciting to be in the audience when the votes were announced in favor of the Copperleaf Vision 2020 project. To be spread out over two years, the entire project involves updating the security building, additional parking at the Clubhouse, expanding the dining room, modernizing the kitchen, resurfacing the tennis and Bocce courts, updating the pool, constructing a fitness center and, of course, renovating the golf course. An immense amount of work has been completed in the planning stages from both staff and volunteer members and with all neighborhoods passing a favorable vote, putting those plans into action is now underway. During the summer of 2014, the kitchen, dining room and parking lot modifications will be completed with the remaining projects undertaken during the summer of 2015. Kipp Schulties, our golf course renovation architect, was thrilled to hear the news of the positive vote and will now begin to draft more detailed drawings to renovate the course using his approved Master Plan. A bid package will be created detailing the scope of work and sent to invited golf construction contractors to bid on the project. Prospective contractors will be interviewed by the Golf Course Construction Committee and a contractor selected toward the end of 2014. The golf course will be closed next year from April 13 until a projected opening date of October 31, however, for those of you that are year round residents, there will be an extensive Reciprocal list of golf courses for you to play during the renovation period. Jason Miller, our Head Golf Professional, will be reaching out to area Club's to secure an expanded Reciprocal season beginning at our closing date and extending to opening day. 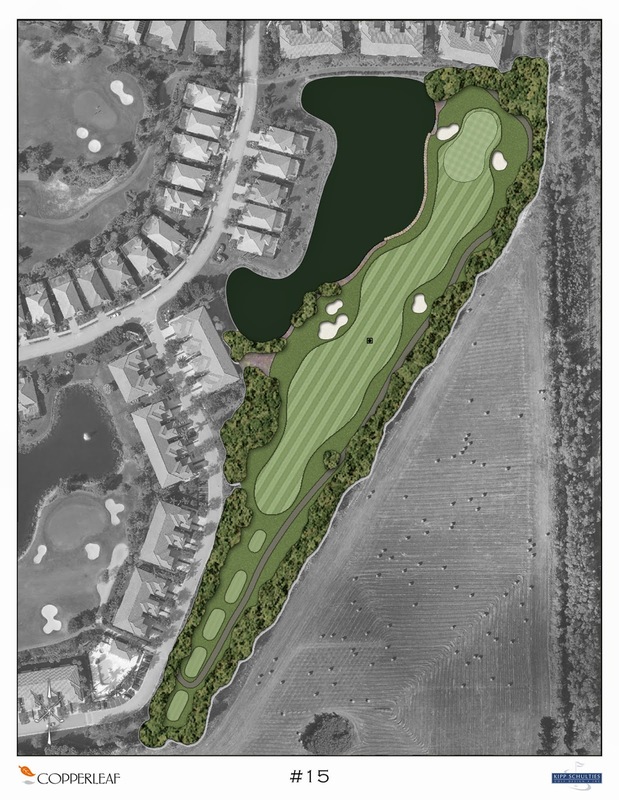 Having previously assisted in the construction of 54 holes of golf including 36 holes at Tiburon Golf Club and 18 holes at Golf Club of the Everglades here in Naples; I am prepared to once again assist in a successful renovation at Copperleaf. Our Assistant Superintendent, Riaan Potgieter has also assisted in the grassing of 36 holes of golf including 18 holes at Stone Bridge Golf Club and 18 holes at Vasari Golf Club. We have an excellent team in place to ensure a successful project and hope that Mother Nature will be on our side during the summer of 2015. The bulk of the renovation work will revolve around the greens complexes as many of them are being slightly relocated and elevated to not only improve playability, but to also improve drainage. At present time our greens are constructed too low and this has a negative impact on water infiltration and oxygen exchange within the soil, in particularly during heavy rain events and high water levels in our lakes during the summer. As the greens are reconstructed, Kipp will provide some improved, yet subtle, movement to the putting surface for all members to enjoy. Ground Penetrating Radar was used to evaluate the drainage on our greens. In this image of Hole 16, over half of the greens drainage system was under water and simply not draining. After heavy rain events, rain water pools on our greens surfaces, as seen here on Hole 5. Other improvements planned for the renovation include the rebuilding of any remaining bunkers as well as the addition of new bunkers in strategic locations. All cart paths will be over-laid with new asphalt with several locations being modified to improve playability. 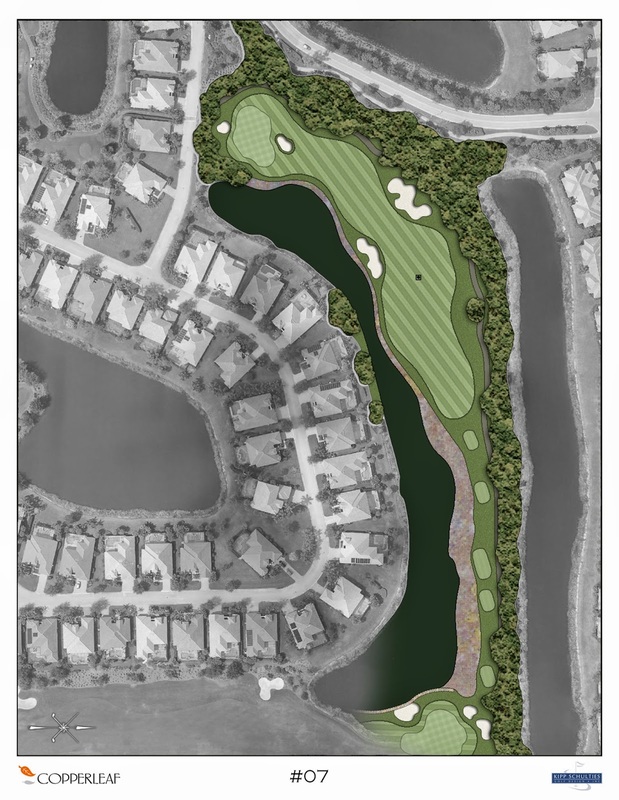 Rock walls will be constructed on Holes 2, 6, 15 and 18 as well as modifications to the existing walls at the Putting Green and Hole 11 to enlarge the play areas. All Coquina Waste Bunkers will be eliminated and asphalt installed in its place. All tees will be leveled and widened where appropriate to maximize the playing area and several tees will also be aligned with the fairway to improve playability. Finally, all turfgrass on the fairways and roughs will be replaced with Celebration Bermudagrass to provide a consistent and uniform playing surface. 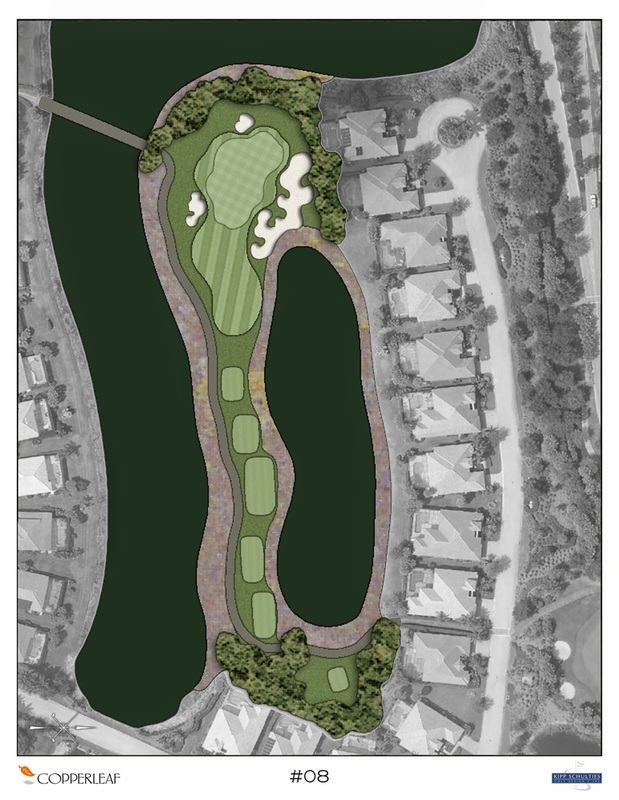 Some exciting changes to the golf course will involve the modification to several lakes. 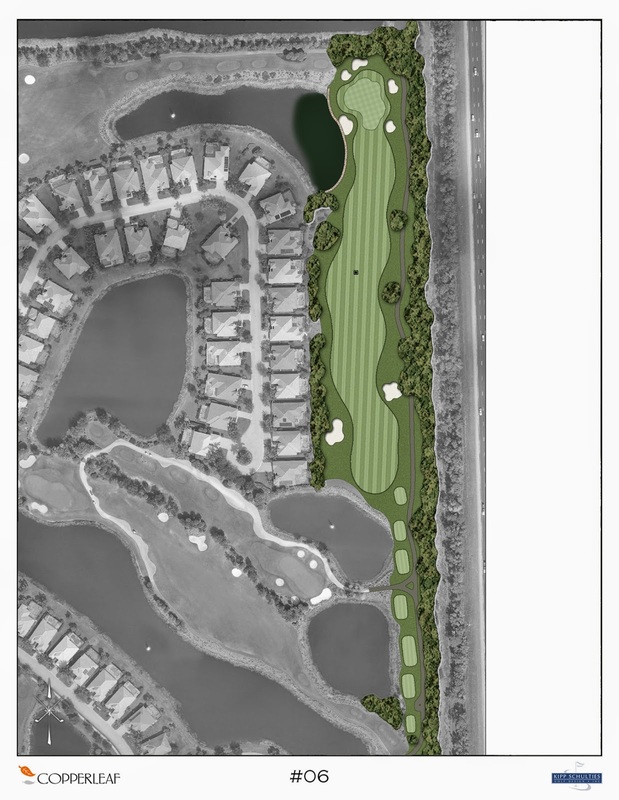 Hole 5 will have the lake extended considerably toward the tee complex; Hole 7 will have the two lakes connected to the left side of the fairway; Hole 9 will have the lake on the left extended partially toward the fairway and Hole 16 will have the lake extended toward the Blue tee. Beside the aesthetic improvement to the course, the soil generated from these sites will be used to elevate the greens and improve the greens surrounds. To prepare the course for the renovation, all turfgrass on the tees, fairways and rough will have Round Up applied to it during the week of March 16. Within 7 days, the grass will begin to turn off color as it begins to die. A second application will be made during the week of March 30 to ensure the successful elimination of the original turf. The Round Up will be applied in the early morning hours and will not be applied any where near existing plant material on the golf course or residents gardens. Appropriate nozzles and surfactants will be utilized to eliminate any drift potential. 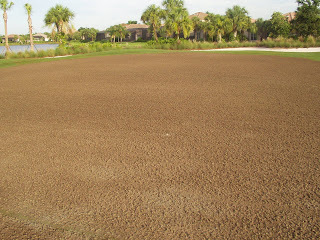 The Greens will not have Round Up applied to them as they are going to be completely excavated during the renovation. They will remain green until April 12. 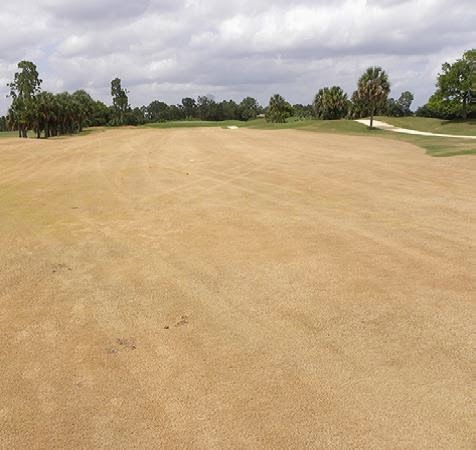 Without question, visually, the golf course will look different during this turfgrass elimination process; however, it will play very well with additional ball roll on the fairways and an overall different golfing experience. However, for those of you planning vacations or renting your homes during the last weeks of March, please know that the golf course will be different; so please plan accordingly and educate any guests or renters ahead of time. The actual construction of the golf course will take between 100 to 120 days; and the establishment, or "grow-in" of the turfgrass a further 100 to 120 days; depending on weather. These final 3 months are critical to be able to strengthen the grass before play commences and the cool weather returns. Expect the greens to be extremely firm and a little slower than you have been used to for the first 6 to 9 months of play or at least until they have gone through a summer of growth. 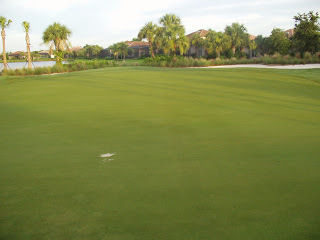 It will be a priority to protect the turfgrass above all else while it matures and becomes fully established. I am personally looking forward to the project and making the improvements to an already enjoyable golf course. With the upgrading of the other amenities over the next 2 years; Copperleaf will continue to be a premier Community within SW Florida and a place that you will proudly call "home". If you have any questions about the project, please do not hesitate to contact me at davidd@copperleafgc.com at any time. As the summer heat and humidity begin to return to Copperleaf, many of you will be heading North or planning your summer vacations. As you make those plans, I wanted to remind you of the scheduled course closures for this year. Beginning May 14, the course will be closed each Wednesday through to the end of September. Many smaller projects are completed on these days without the need to prepare the golf course for play or impacting golfers. 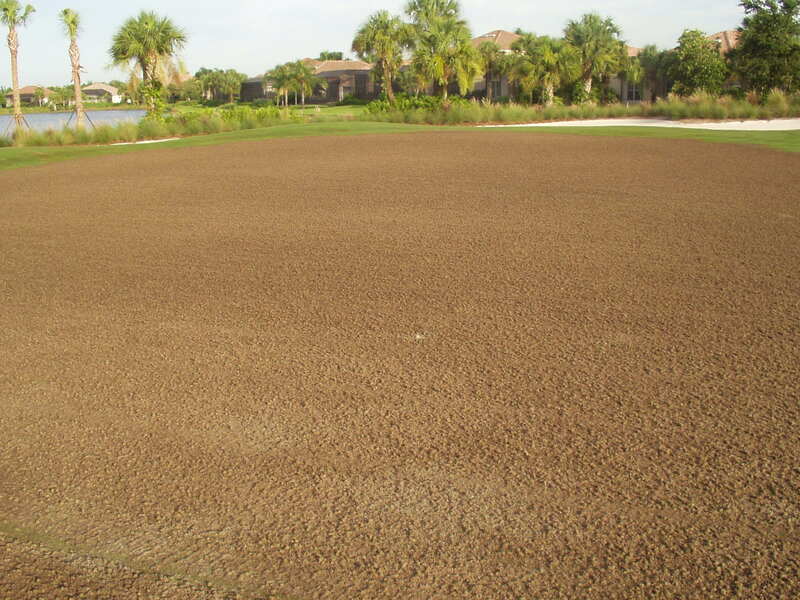 These projects include spiking, verti-cutting and sanding greens and other cultural practices including aerification of tees and roughs as well as golf course enhancements and detail work. ﻿﻿﻿﻿﻿﻿﻿During July and August, the course will be closed for 10 consecutive days each month. During this time, the greens are aggressively aerified to remove organic material and dilute the soil profile with new sand. All fairways are verti-cut and aerified to remove thatch thus providing a high quality surface to play from. ﻿﻿﻿﻿﻿﻿﻿﻿﻿This amount of time not only allows for the work to be completed but importantly, allows time for recovery. When the course opens for play, it is in excellent condition for our full-time residents and reciprocal players. September also has a 3 day consecutive closure allowing for end of summer fertilizing and top-dressing of fairways. Applying sand to the fairways is a relatively new practice at Copperleaf and provides improved ball roll, improved drainage and superior turf conditions. 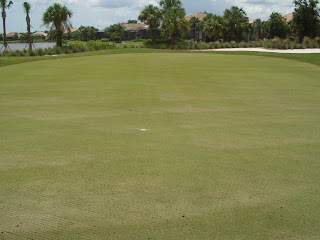 The end result of these closures is a course that has received the necessary remediation after a busy golfing season. The impact of over 43,000 rounds of golf and golf cart traffic has a dramatic impact on the ability to provide quality playing conditions. Soil compaction that inhibits water, nutrient and root penetration; organic material build up that prevents fertilizer uptake, promotes turf diseases and provides "spongy" conditions and year round turf growth require aggressive cultural practices.